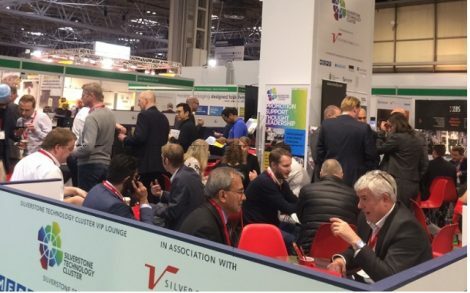 A staggering 1300 guests booked to visit the Silverstone Technology Cluster VIP Lounge in association with Silverstone Park at the AES (Weds 1-Thurs 2 November) at NEC Birmingham. Guests at the Lounge were able to meet with Silverstone Park Commercial Director Roz Bird and Silverstone Technology Cluster CEO Pim van Baarsen. Also present were Silverstone Park developer MEPC (and its Chief Executive James Dipple), Barclays, EMW, Grant Thornton, Hexagon Manufacturing Intelligence and Aylesbury Vale District and South Northamptonshire councils – all STC Board members. STC ambassadors Roger Atkins (Electric Vehicles Outlook) and Stephen Ball (former CEO of Lockheed Martin UK) were among the guest speakers. Meanwhile Rob Lewis OBE and Kieron Salter – managing directors of STC companies TotalSim and KW Special Projects – gave presentations on aerodynamics and digital and advanced manufacturing. Rob and Kieron are champions of the STC’s Computer Aided Engineering (CAE) and Digital/Advanced Manufacturing (DAM) special interest groups (SIGs). Roz Bird commented: “The Advanced Engineering Show has exceeded our expectations – hosting the VIP Lounge in the middle of such a big industry event and offering people the chance to chat over coffee in informal and comfortable surroundings was one hundred per cent the right thing to do. It’s made for a brilliant couple of days of networking. “In fact I have always thought the show has the right sort of audience for us in terms of advanced engineering, electronics and software development and that has proven to be very true. STC was launched in December 2016, to promote the region within an hour’s radius of Silverstone – identified in a high profile SQW report as being home to around 4,000 companies with exceptional capabilities in high-tech engineering, and recognised by the UK government as having ‘latent potential’. Pim van Baarsen added: “This has been a fantastic opportunity to further raise the profile of the STC with a highly relevant audience and increasingly the message coming back from companies has been: ‘thank goodness someone is taking a lead on this’. Meanwhile Silverstone Technology Cluster has confirmed it will host its first Annual Conference at Silverstone Park on Thursday 25 January 2018. The event will showcase the STC’s capabilities via presentations from companies within the Cluster, ranging from computational fluid dynamics to additive manufacturing, the Industrial Internet of Things (IIoT), ‘big data’, software engineering and electronics. But as Pim also explained: “We are lining up a number of presentations from ‘large corporates’ and some of the catapults as well as other significant global names. This month Silverstone Park’s Metrology Facility will also host the STC’s CAE and Autonomous, Connected, Electrified & Shared (ACES) vehicles technologies SIGs. ACES will meet 9:00-11:00 this Thursday 9 November and CAE at 17:00 on Tuesday 28 November when Wirth Research and Cranfield University will be among those giving presentations with a third guest speaker to be announced soon.